Research, it is has been claimed, shows little difference in personality between genders. 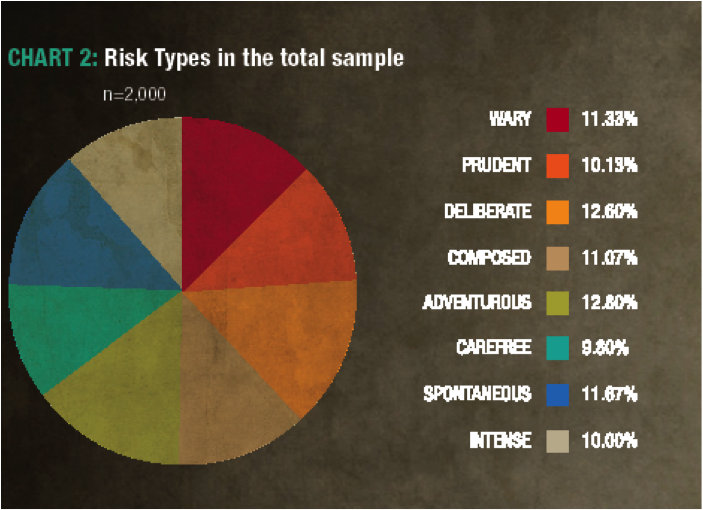 This has been disputed recently by others and our own research into personality based Risk Type shows that, although both genders include significant numbers of all the Risk Types, there are quite dramatic differences in the incidents of Risk Type for males and females (diagram 1). 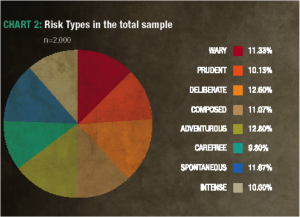 Amongst females there is a greater proportion of the more cautious Risk Types, and amongst males, a greater proportion of more adventurous and reckless Risk Types. But what is really interesting, is that if you combine male and female data, the incidents of all eight Risk Types is almost exactly equal (diagram 2). This rather extraordinary symmetry of Risk Types across the population as a whole suggests firstly, that all the Risk Types are broadly equal in evolutionary significance and secondly, that the genders complement and compensate for each other almost perfectly. This variety in disposition towards risk appears to have been beneficial for the development of our species during times when kinship groups fought for survival against the severe predations of life and the aggression of rival groups. Species survival depends on bio-diversity and this applies as much to risk taking as it does to anything else. Neither unrestrained risk taking, nor unmitigated caution would have cut it for very long but, at the species level, the varied combination of both seems to have been efficient in meeting needs and exploiting opportunities. Whether or not this is a genetic difference, it is likely to have been a pattern of gender differentiation that persisted over tens of thousands of years. The differentiation of gender roles that emerged could have been either a consequence of these differences, or the cause of them. These findings raise important questions about gender balance in today’s business world. There is wide appreciation of the need for greater equality at the top levels in organisations, in politics and in other policy and decision-making bodies, so how might these research findings contribute to our understanding of that situation and how should we approach these challenges? Of course, not all males are more competitive, combative and risk taking than all females. Neither are these characteristics that predominate amongst males in all roles, but there are more males that display these characteristics. The difference is in the proportion of each gender that would be described in this way, not in the extremes they may reach. There are males and females amongst all Risk Types, and many females will be fully capable of competing with men in terms of risk taking. However, it is important to recognize the possibility of achieving a wider spectrum of Risk Types, whatever their gender. Replicating at the top of organisations the balance of Risk Types that appears to have been effective from a species survival perspective. Balancing Risk Types within decision-making bodies would help ensure that longer term issues and the wider impact of risk decisions were considered. Looking with hindsight at the impact of unrestrained risk-taking on the economy, we should perhaps consider to what extent our recent economic woes were exacerbated by the Risk Type bias inherent in male over representation. Shouldn’t we be arguing for a greater balance of Risk Types? As a pragmatic and sensible step towards instilling the checks and balances required to maintain financial equilibrium, this may be more effective than any amount of regulation. It just happens that this would also go a long way to improving the gender balance.